Thank you to all the residents that volunteered to help Santa this year. 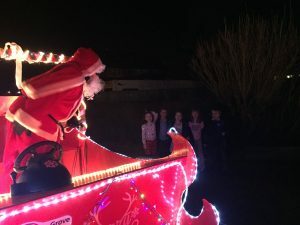 Rennie Grove Hospice are pleased to confirm that they are able to visit on 17th December (around Castlemead) and 18th December (around the rest of the village). Below you will find the route maps for each date. Please be aware that Santa’s sleigh needs lots of space to turn around and we have many cul-de-sacs and tight roads in Pitstone, so whilst Santa will try his best, he may not be able to pass right by your door. Santa hopes to set off at about 5.45pm and won’t be out later than 8.15pm as he needs his rest before Christmas Eve. Please provide a donation when Santa visits, if you are able, to help fund their vital work.